Members gathered at the Guildhall, welcomed by Margaret Kirby, Service Manager for Heritage and Arts, and her talk on the WW1 Project ‘For King and Country’. 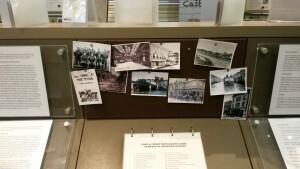 This HLF project fostered partnerships across the local area, and developed to involve the stories of those living outside of the region. Margaret explained how to project involved schools, the donation of objects, volunteer engagement, walks, talks, and the creation of a database and learning resources. She highlighted for members some of the challenges in uncovering local history, and the benefits of recording the impact of the project for long-term sustainability and future funding applications. After a pit stop for lunch, we headed to the Eton Natural History Museum, where Curator George Fussey explained how the collection was originally curated by pupils and used in their studies. The Museum has recently open its doors to a warm reception from the public, and is utilising QR codes to reach out to new audiences. 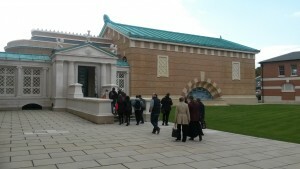 George showed us the new Jafar Gallery of Antiquities that opened in 2015, which is used for pupils of Eton, in addition to outreach projects and academic research. Over to the Museum of Eton Life, Curator Rebecca Tessier welcomed to the museum which tells the story of Eton and the life of its pupils, and includes a staged dormitory, old uniform,and videos of contemporary school life. She explained the challenges of housing a collection within an old beer cellar, and planning the launch of public access within the school site. Many thanks to Windsor Museum and Guildhall, and the Eton Museums.